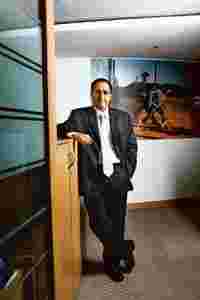 New Delhi: Jai Menon shot to the limelight about four years ago as the brains behind Bharti Airtel Ltd’s big push on outsourcing network and tech management functions to vendors such as Telefon AB LM Ericsson, Nokia Oyj, International Business Machines Corp. (IBM) and Oracle Corp. Instead of carrying such fixed costs on its balance sheet, Bharti Airtel, India’s biggest mobile phone services firm, converted the expense into an operational cost linked to efficiency and usage levels. These days, Menon is trying to drive similar changes in customer service at Airtel, which had some 75 million customers. In an industry infamous for its poor customer service and technology support, Airtel’s group chief information officer and director of technology customer service wants to change the way phone subscribers are served by placing incentives before its outsourced service firms to focus on the outcome of customer interaction. How have the last quarters been? To get to this, if I had to look at the top three programmes that we have put together for service—one is implement a very solid shared service capability for all customers including business to business and business to consumer (B2C). Second one is, empower the customer enormously through self care, and the third one is, building intelligence in to service so that you can actually do customized service. Something like a concierge service but not the expensive kind. Any of this being driven by models used elsewhere? A few things are, but a few things we are inventing for the first time in the world. Within shared services, there are some best practices we are adopting from the world...one practice is taking all the fragmented shared services and consolidating them. For example, we have now consolidated 105 agencies that did our address verification work to four agencies. This allows us to build quality control and repeatability into the system. It has taken about a year to finish this. Another example is bill printing that just got done last Friday. We print a lot of postpaid and prepaid bills for both the mobile business and the broadband business. This has been consolidated from 18 to two locations in Manesar and Chennai with one partner, EIH (East India Hotels Ltd, the owner of Oberoi hotel chain). We can print 1,000 pages a minute (each machine) with the ability to do targeted marketing inserts and every customer can get a customized bill. Same for document management (digitizing address verification documents, for instance) where 23 locations have come down to four. All this, brings in a lot of quality and repeatability along with a number of other advantages. Similarly in inbound calling, how do you handle quality with one million calls a day? We work with only six large BPO (business process outsourcing) firms. Then, a new initiative I completed just a few weeks ago is a platinum centre to focus on our top customers. This centre takes care of the end-to-end life cycle of the customer ranging from the initially hello to informing if a service is down among other things. The key innovation here is that I am working on fundamentally changing the BPO business model (serving telecom firms). I call it the O/E ratio or output-effort ratio. The payment mechanism for the BPO industry today is all about when an agent picks up a customer phone call and when it is put back—the duration of my call is what I am paid for. That does not necessarily mean my customer query has been answered or issue resolved. It was never linked to business outcome. This model is very similar to the IT industry—you pay money to buy servers or software or systems integration. In the IBM transformation, we linked everything to revenue. Here also I started thinking—how can I link BPO performance to churn or customer satisfaction. This has already been done in the platinum centre that is handled by IBM Daksh. We already have a outcome-based model with them where churn, customer satisfaction, everything is linked to KPIs (key performance indicators) and revenues are linked to these parameters. How do you measure these? Though rigorous customer service management techniques that we do through (research agency) IMRB. We are in the middle of rolling it out and you will expect to see it at work between November and February. We just signed the agreement and we are recruiting and training people and by the end of this month it should start. If I’m a platinum customer and during an interaction with a customer service agent, my call gets dropped do I get reconnected to the same agent I was speaking with when I call back the BPO firm or do I go to a new guy and explain my trouble all over again? We want to take you to the same guy. We can keep the guy free for the next few minutes and it is in our records who you called. What about Blackberry customers who get frustrated with mail delays? BlackBerry will be part of platinum. We are rolling BlackBerry, data cards, platinum broadband and mobile customers, all enterprise customers and some SME (small and medium enterprises) customers into this service. And if customers give us more ideas, we want to implement them. We are going to invest in it and it’s not about cost cutting, it’s really about investment for service. You have earlier talked about a single screen for your agents. How does that work? This is the third innovation in shared services driven by technology. Within tech, there are two things we are doing. One, we are bringing down the screen of the call centre agents to one from 12 to 14; we call it UDT or unified desktop. It is now rolled out in the eastern part of the country and it is getting “massified" across the country. There are multiple applications behind the scenes, which have all been stitched into one single screen for the agents and makes the interaction so simple for the agents, making their response time very fast. The second thing that was done is called hosted CCT—contact centre technology, which routes calls where agents and skills are available among our BPO firms. Not only does the BPO firm not have to worry about the technology but more importantly, the entire pool (of six firms) becomes available to resolve a query. Yes, the second pillar is self care. Within B2C, we have done two very powerful things. First is the *121# service that is usable across all phones making the adoption very high. Total number of transactions in a month that we are clocking now is close to 80 million. We have so far not advertised this above the line but only below the line through word of mouth. I am going to take an above the line campaign on service soon. The great thing about this is that today it is the menu with five or six options such as unpaid billing, etc.… In future, I can add other options to it. People don’t have to wait on a call to get this information and can just dial *121# and get all they need. What self care is on the web for financial services industry, this is for the mobile sector. This tool is very popular for rural but can only be done in vernacular in the fields of education and agriculture. We are working closely with handset manufacturers and moving towards taking all our services vernacular. How much has this self-care service reduced stress on the system? Rather than stress reduction, this service has made the level of interaction with call centres a little higher. You don’t need to call. Then, we launched the mChek platform for mobile payment, post and prepaid. Today we have about half million users registered. Customers using e-bills today is crossing 20% and web usage is 30% of postpaid and fixed line customers. We are going to go really aggressive on self care as the customer should feel all powerful and give the customer the benefit of needing help from someone else only in a dire situation. From cost perspective, what are the benefits of self-care? I think the way we see it, this is more curative in the sense it gives you immediate response. From our own cost point of view, we are not trying to reduce the human contact with customers. We like the human contact. We are looking at it as changing the value proposition of the contact. We are building a credit scoring system based on the one used by the financial services sector based on payment patterns, usage, volume or size of the bill and other such factors. This allows us to inject segmentation into all our platforms allowing us, for instance, to change our policy where the service barring policy is different for gold customers or silver customers and so on. We are also working on predicting churn using business intelligence and analytics to understand customer behaviour patterns.